Paula has been a qualified dental nurse since 2006, joining Torrington Dental Practice in 2007. She has since gone on to qualify as a sedation dental nurse, gaining the NEBDN Certificate in Conscious Sedation. 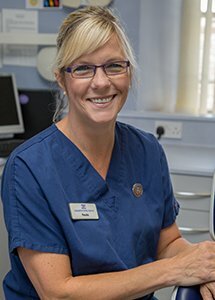 As part of her sedation team leader role, she coordinates the sedation clinics at Torrington Dental Practice which we run for sessions per week to care for our anxious patients. In addition to her Basic Life Support qualification, Paula also holds the Intermediate Life Support Qualification, a mandatory requirement for all our Sedation Team. Paula is also responsible for the ordering and stock control at the practice. Outside of work, Paula is a volunteer Community First Responder for Southwest Ambulance Service, helping local people in the Torrington area. When she has some spare time, Paula’s hobbies include running, reading and looking after her grandchildren.